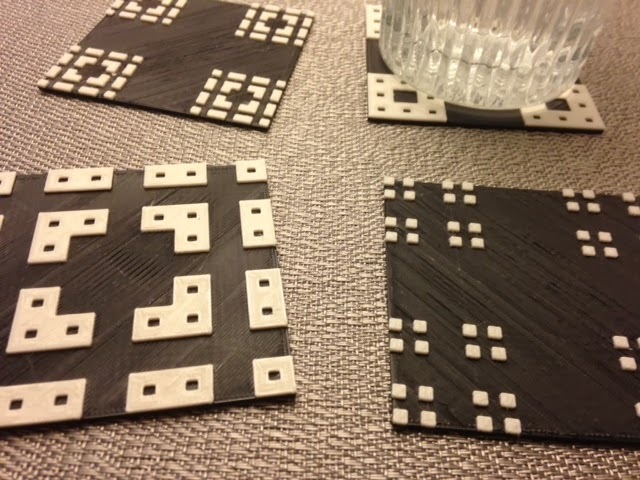 Settings: Like yesterday, we used Makerware .3mm/low,for a print time of about 30 minutes per coaster, with color swap just after 20 minutes or so. Technical notes: See yesterday's post for hints about when to make the filament color swap. As you can see from the picture, the Replicator 2 is giving me some "stringy" behavior on the long traverses of black. I wonder if I could fix this with a temperature change or some other change? If anyone has any ideas please let me know. UPDATE: On Day 127 we figured out how to fix the "stringy" problem - change to .2mm/standard layer height. I imagine that change would also work for this model.